DSD: One*Oak*Hill Harlequin Marin (V 89) LA 3-03 89 VVVE 2000 ADGA National 8th 2 y.o. 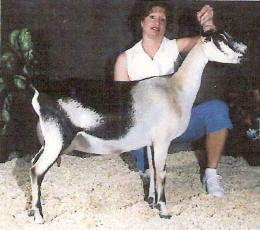 Typical of the Sorcerer progeny, Tinkerbell excels in nearly every category. She is a very correct doe with a long bone pattern, wonderful dairy character, good width from her chest to her hocks, proper leg set front & rear, & with nice angulation. She is sharp-withered with terrific shoulder assembly, a strong, long & level back ending in an admirable, wide & flat rump. Her mammary is ideal being very well attached all the way around, showing a high & wide rear arch, excellent overall globularity with a good, strong medial, very nice teat size/shape/placement & a particularly exceptional fore udder. Prior to joining the herd, Tinkerbell unfortunately foundered & suffered a teat injury that caused some severe cosmetic damage, eliminating a future show career. She is nonetheless considered a valuable contributor to our breeding program in the form of the excellent progeny we look forward to her producing! 2007 Update: Tinkerbell blessed us with magNIficent twin Draw daughters! 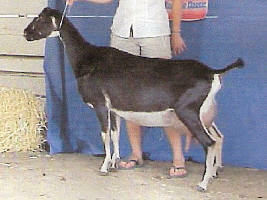 CH Autumn Acres Thyme’s Trista LA 03-03 VEEE 91, 2003 ADGA National 5th Intermediate Kid RG, 2004 ADGA National 1st Yrlg milker, & 2006 ADGA National 5th 3 y.o.